Ekajati (Tib. Ral-gCig-ma), meaning the ‘Single Hair-lock’ (Skt. eka-jata), is an important wrathful goddess of Indian Buddhist origin who is depicted with one eye, one tooth, one breast, and sometimes with only one leg. Along with Rahula and Vajrasadhu (Tib. 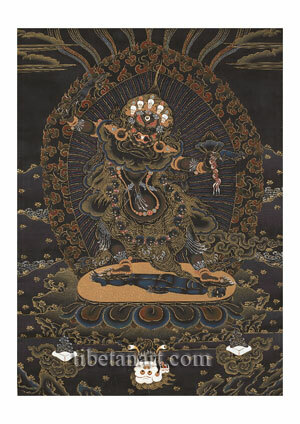 Dorje Legpa) she serves as one of the three main protectors of the Dzogchen teachings, particularly within the Nyingma tradition, where she is also known as a protector of mantras and as the ‘Queen of the mamo’ or wrathful mother goddesses. Ekajati stands leaning towards the right in pratyalidha posture, with her two feet pressing upon the head and legs of the stiffened corpse of an enemy, which lies upon a golden sun disc above a variegated lotus and a triangular vajra-rock formation. She is extremely wrathful and dark reddish-brown in colour, with a fierce face, two arms, one eye, one tooth, one breast, and the ascending ‘single hair-lock’ from which her name is derived. Her single round and menacing red eye is in the centre of her forehead and represents her unified wisdom-awareness. In place of her other two eyes appear the facial creases of their empty sockets, with fiery eyebrows blazing above them. Her nose is wrinkled and her mouth gapes open as she reveals her sharp single tooth and her twisting red tongue. Her tawny facial hair bristles upward like fire, and her long matted hair-locks hang freely down her right and left sides, with a solitary twisted plait of ‘iron hair’ rising up from the crown of her head. From her gaping mouth and lower orifices she exudes a poisonous mist that spreads pestilence over her demonic enemies, while simultaneously serving to protect all secret teachings and mantras. She wears the five bone ornaments of a dakini, along with golden earrings, bracelets, armlets, anklets, a necklace, and a crown adorned with five dry white skulls. Around her neck hangs a garland of fifty freshly severed heads that are strung upon a thread of intestines. As a lower garment she wears a tiger-skin skirt or loincloth, and as upper garments the flayed skin of a human enemy, and a cloud-collar and cape. The human-skin is looped around her neck and hangs behind her back like a shawl, and her cloud-collar and cape is edged with an indigo border and billows out behind her body. Below the cloud collar hangs her single sagging and nectar-streaming breast, which symbolizes that she protects the teachings as if they were her only son, and nourishes practitioners with the great bliss of her compassion and wisdom-awareness. With her right hand she wields aloft a corpse-club fashioned from the mummified body of an enemy, symbolizing how her understanding of emptiness has dried-out the corpse of appearances. With her left hand she holds the torn-out heart of an enemy with three twisting life-veins hanging beneath it, which she consumes as food. This heart represents the dharmakaya, and her holding of it reveals how her awareness is ‘fused’ with reality. With her left hand she also releases a female iron-wolf that serves as her principal ‘messenger’ to swiftly lure all demonic enemies into her sphere of activity. Light rays emanate from Ekajati’s body and she is encircled by a blazing aura of wisdom fire. In front of her is an upturned skull with scalped hair that contains the five torn-out sense organs of eyes, ears, a nose, a tongue and a heart; and flanking this are two cloud-borne skull-cups that contain swirling blue nectar and fresh blood.